OK – this is CLASSIC! I came across this photo and absolutely HAD TO share it! 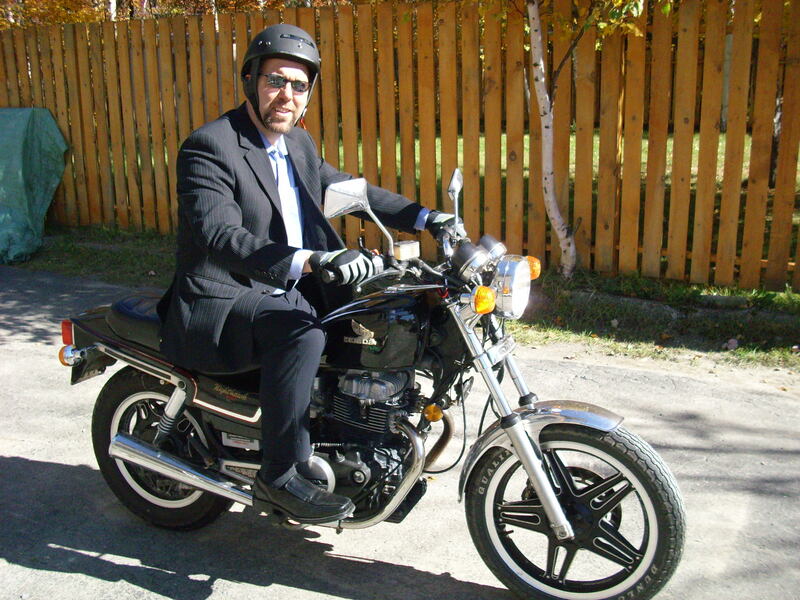 This is my man – my preacher man – riding off to perform a wedding one Saturday in September. I can just imagine him pulling up to the church on his 1982 Honda Nighthawk, everyone smiling (including him – in fact he probably had the biggest smile on his face! ), getting off the bike, taking off his helmet and strolling casually into the front doors of the church. Classic Josh. If you knew him, you’d understand. There are many things I love about this motorcycle preacher man of mine, and this picture captures just one of them – his freedom in being who he is, not afraid to share it with the world, not afraid to live in it no matter how the years pass, no matter who’s watching. I love you Joshua, and no, I’m not ready to get on the bike yet!